With pristine waters and rolling farm fields, on the surface West Michigan seems a perfectly healthy place to live. So why do rural residents of Michigan tend to have more chronic illness and higher mortality and morbidity rates than their urban and suburban counterparts? It’s a complex question, according to Dr. Dawn Contreras, senior specialist with the Michigan State University (MSU) Extension Health and Nutrition Institute, who has researched rural and urban health disparities. She says there are no definitive answers, but there is one undeniable contributing factor. “The research clearly shows there’s isolation, both physical and social isolation,” Contreras says. That means the nearest supermarket is often miles away for rural residents, and so is the nearest trauma center. Rural Michigan residents’ access to healthcare depends on many aspects of their lives, not only their income or what kind of insurance they carry. Health care providers have long known that these social determinants have a major impact on health. In city or country, a person isolated by lack of reliable transportation or affordable childcare is less likely to follow up on a referral to a doctor’s appointment in the city, even if that city is only an hour away. Working even more subtly, language or cultural barriers may also cause patients to hesitate to ask questions or even report symptoms. “We have to understand as providers (that social determinants) contribute to impacts of disease and disparities we see,” says Dr. Cheryl Dickson, associate dean of health equity and community affairs at the Western Michigan University (WMU) Homer Stryker M.D. School of Medicine in Kalamazoo. To address these disparities throughout western Michigan, Dickson and others are creating new ways of structuring hospitals and clinics, reaching out to patients, and training the doctors that will care for them. 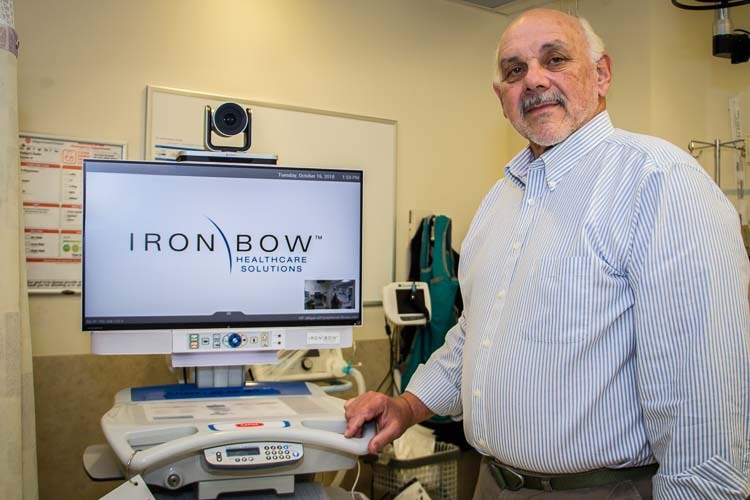 For example, in rural Allegan County, a local hospital has implemented a new team approach to use technology to help stroke victims beat a race against time. Doctors have long known that a clot-busting drug administered to patients in the earliest stages of a stroke can dissolve the blockage in the brain before long-term damage is done. “It’s like a miracle drug,” says Jim Connell, secretary of the board of trustees of Allegan General Hospital. A miracle with one hitch: the drug has to be administered by a neurologist in the very earliest stages of the stroke. “So people come into the emergency room exhibiting signs of a stroke — and, of course, because country folk are strong-willed, the patient likely has been exhibiting those signs of a stroke for about an hour and a half before the wife finally decides to drag him in,” Connell says. There is no neurologist on staff at Allegan General Hospital, so in the past, Connell says, “the ER staff would load up the ambulance, go red lights and siren, and do everything they could do” to get stroke patients to a neurological unit in Grand Rapids or Kalamazoo before time ran out. 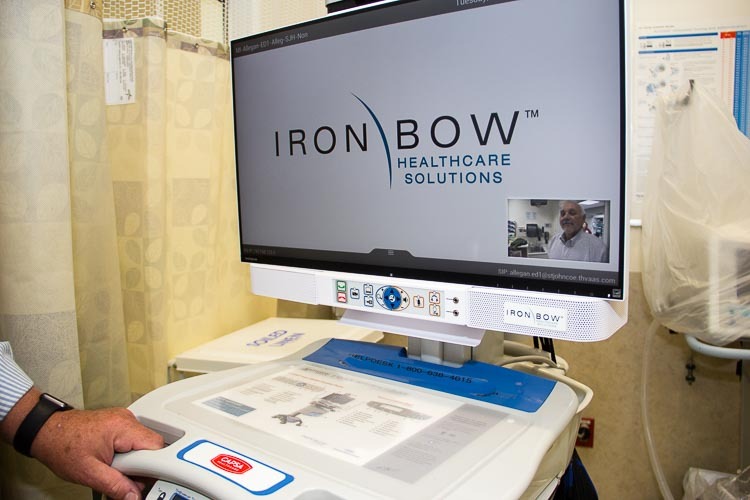 The new TeleStroke system allows emergency physicians to connect the patient with the neurology department of a neighboring urban hospital for diagnosis. Under the neurologists’ guidance, doctors at Allegan General can then proceed to treat the patient with the proper medication. Allegan General Hospital’s TeleStroke system. Other new approaches are as old-fashioned as a house call in their simplicity. For example, in the fields of Van Buren County, a mobile clinic from Hartford-based Holy Family Healthcare parks in the fields to serve migrant workers during peak harvest season, from asparagus in April to apples in October. The practice accepts Medicaid, Medicare, and nearly all major insurance plans; uninsured adults are seen by appointment as well. 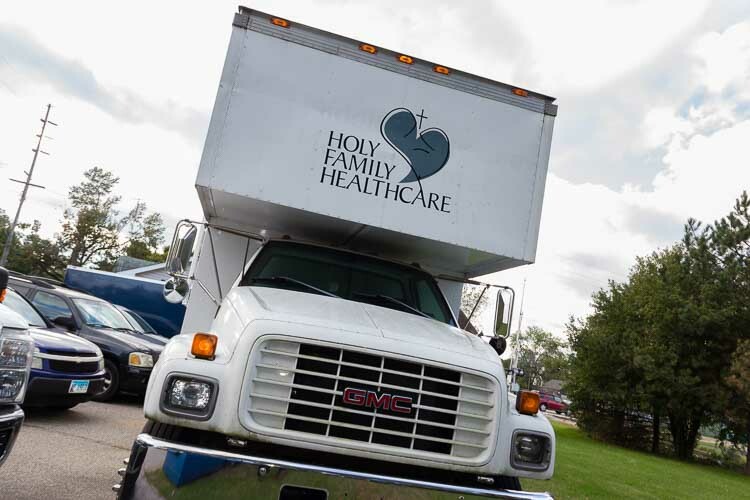 Holy Family Healthcare’s mobile clinic. Holy Family staff also offer food and clothing for workers. The clinic’s Saturday session now gets staffing help from volunteer medical students at the WMU Stryker school. The program helps medical students learn about the challenges patients face and gives them practical experience, Dickson says. 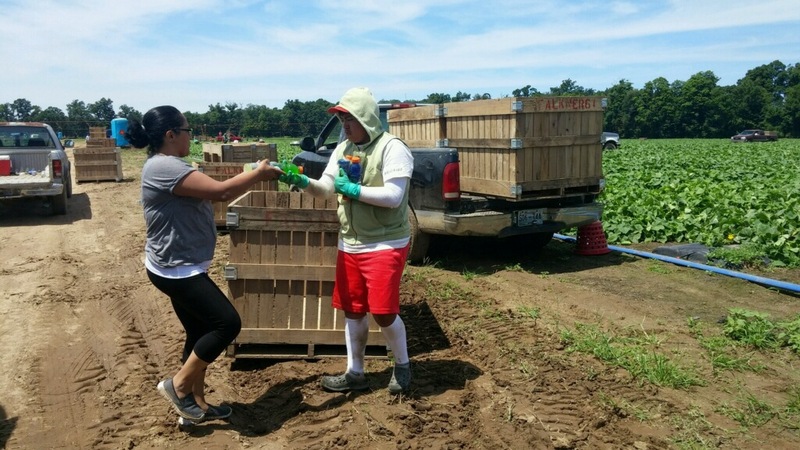 Holy Family Healthcare’s mobile clinic delivers Gatorade to migrant workers. Similarly, in some rural towns, local hospitals are bringing in specialists from larger cities to hold office hours a few days a week. There are benefits both for rural patients, who can avoid the long drive, and doctors, who are able to expand their patient base. Connell, a retired rural veterinarian, has himself been helped by a visiting specialist. He first saw a cardiologist from Kalamazoo at the doctor’s weekly office hours in Allegan, a convenience Connell says likely saved his life last November. Connell says he’d had no symptoms of heart trouble and was training for a triathlon when his primary care physician recommended a cardiac workup after an annual physical last year. It was a matter of walking down the hall. Fully expecting to get a clean bill of health there, Connell was instead scheduled for open heart surgery two days later. Without such easy access to a cardiologist’s expertise, Connell says he could easily have become just another statistic – the seemingly healthy guy who collapses and dies from undetected heart disease. Important as these changes are, Dickson says rural health equity goes beyond creating quick, convenient access to doctors during times of illness. Health care providers and service agencies are partnering up to study how changes in policy and practice can improve rural health outcomes before people get sick. A new MSU Extension program called Managing Farm Stress works with families suffering from the stresses of farming — volatile prices, unpredictable weather, and financial uncertainties — which are especially severe right now, Contreras says. In addition to working directly with farm families, the program also reaches out to loan officers and other professionals in the community who work with farmers. They are trained to teach coping strategies and to help families reduce stress. Families and associates alike have been receptive, Contreras says. “(They) are stepping forward and saying ‘We could use the help,’ and we find they are reaching right out,” she says. In an effort to lessen childhood trauma among migrant children, Holy Family Healthcare has launched La Escuela Familiar, a program in Paw Paw to help bilingual students who speak Spanish in the home become proficient in applying English to their studies in school. Don Bouchard, president and medical director of Holy Family Healthcare, says educators have found that children raised speaking Spanish for their first five years often have trouble making the transition to English in school. La Escuela Familiar is conducted entirely in Spanish, and seeks to give children and their families a place to grow together in academic language so they can excel in both English and Spanish. 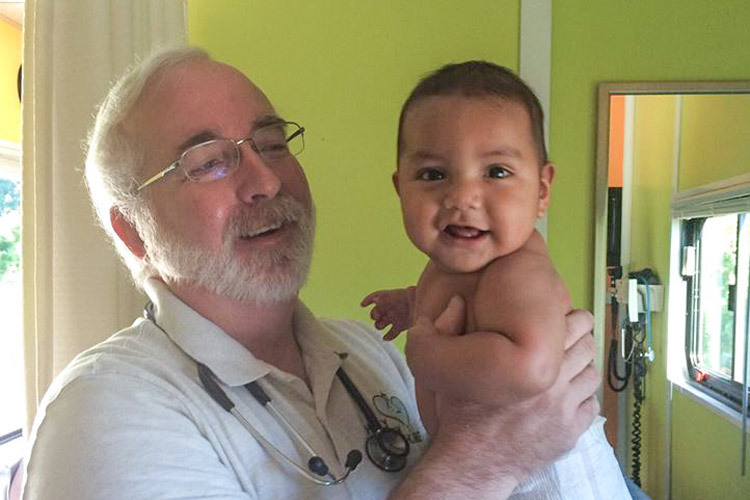 Dr. Don Bouchard with a young patient. This program is intended to help them keep up with their peers, and also to reduce the constant anxiety inherent in their situation as migrants here, “which is made worse by taunting and teasing about their family situation,” Bouchard says. In times of sickness and in times of apparent physical health, these programs and others are helping rural Michiganders of all walks of life better enjoy the many positives their community has to offer. “There are benefits to living in a rural area,” Contreras says. A gap in health equity should not be drawback.